TNT wrote: Still early days, but 3k isn't a very impressive increase. True. But better than decline. There are a few of my buddies who disappeared for about six months or whatever, they want to come back now that Solo is out and summer is coming ... they feel like they can't. I wonder how it feels for new players? Just had that happen to an old squad mate. He's an L9 HQ (mostly L7 and 8 buildings and units though) and has been offline since last year. He came back last month but couldn't win without the armory buffs. He bailed...sad. But I totally understand. He's fighting buffed defenses with no buffed offense... Impossible. I think if old players want to get back in the game, they have to start over and take a long pause at HQ6/7 to build out their armory fragment library. Very interesting that the game has lost over 25% of its players in less than a year!! Today is June 1, 2018 and the number of commanders is 209k. Interesting info, but as I have said before, without the data on players not in a war squad, we dont know anything for certain. ( I realise we cant get that). I regularly check the ingame squads by searching using random 3 letters. There are loads of squads never had a war. There are probably tens of thousands of players not in a squad. The major observable trend is the decrease in players wanting to be in war. It used to be popular but the number of maxed out (or seemingly maxed) squads puts lesser opponents off the game. Concentrating fifteen top players in one squad helps the few but puts the many off war. Equally the number of sandbagger squads adds to the pointlessness of war for many. You only have to look at forum comments to get the message that most get aweful war matchups. Again just my view. Compared to when TLJ came out, these are modest gains, but they are gains. The faction balance is now 57.7 to 42.3. 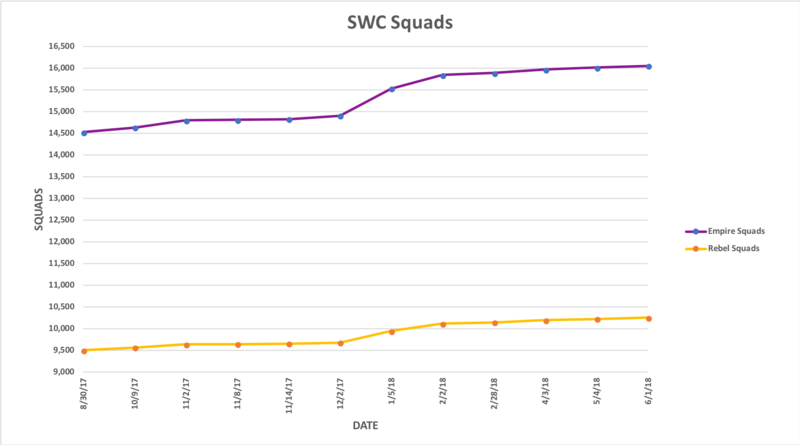 The overall "trend" for the number of Squad per Faction shows a continued gradual ⬆ Increase . 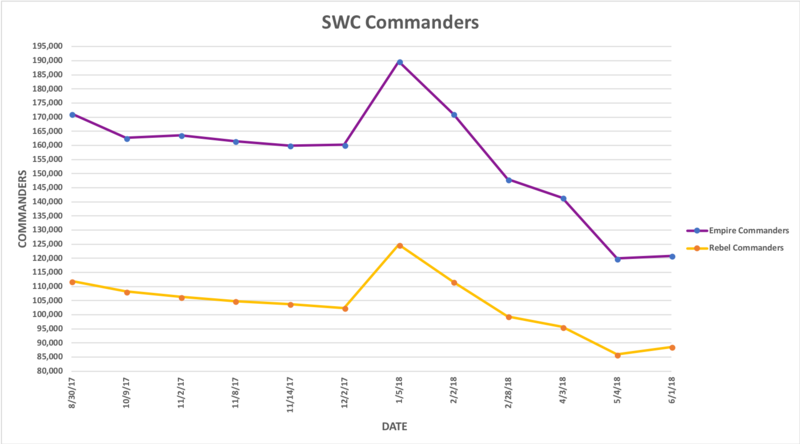 The overall "trend" for the number of Commanders per Faction shows a ⬆ Increase following the release of Star Wars: Solo - A Star Wars Story. The chart above is the 3rd one I created with the 1st one posted here and the 2nd one posted here. As long as I have time, and this Topic is updated, I will post a Updated Chart once a month.